It had been 24 hours since I had last seen my journal. It had to be somewhere in the van. I was convinced that I had put it in the cupboard that had been declared mine for the trip. I was agitated, frustrated and a little upset. After almost a week of living in a confined space with my family, I’m surprised something didn’t go wrong sooner! After searching everywhere else I could think that it might have been, I retraced my last steps. I remember putting the journal away in the cupboard. It dawned on me while I was fishing through Lisa and Mum’s belongings that they have been in and out of the cupboard. Something fell out. One of them definitely mentioned something falling when they opened it. I was ready to lay blame at anyone’s door. Directly below the cupboard in question is a bench seat. This is not looking good. A deck of cards, a postcard are both down the side of the seat. They’re accessible. I’m still bearing a grudge against my family after I lost a handful of pogs down the side of a bench seat in one of their old camper vans at home. Zero effort was made to retrieve them. If something goes beyond reach now, I just assume it’s gone forever. There’s a gap behind the seat. One just wide enough for my journal to slide down. It’s there. I can see the pages, the cover. I poked around at it with a tent pole, skewers held together with ductape, anything that might get under, or in it so I could move it. A couple of postcards came out. Hope blossomed. All was not lost. The journal didn’t budge. If anything it felt like I was pushing it further down. There is absolutely no way that is going to come back out. I was ready to give up. The worst thing was knowing exactly where the journal was and knowing that it was completely out of reach. I know it is just some sheets of paper with ink scrawled on some of the pages. It was irrational of me to have attributed value to a possession, especially one that can be so easily replaced. I had put a lot of time into it, I’d written about India, and Singapore. We had become a team. I kicked off. I didn’t mean to. I was trying to explain why I felt the way I did. I’m not particularly good at saying the right thing when I’m already in a bad mood. On top of my strop, we had some tears and eventually we all came round to accept that there was nothing we could do about it now. We’d be best to just get on with the holiday until we could make further progress with the retrieval of the journal. 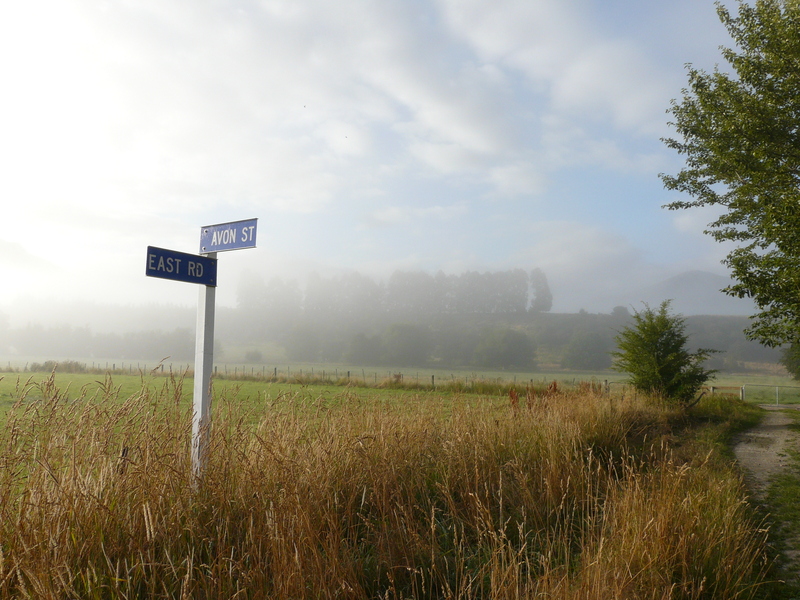 A mist filled morning arrived, bringing with it better moods and we were back on the road. Dad was convinced that he would get the journal back. I wouldn’t believe him until it was in my hands. Back in Queenstown we picked up a screwdriver set so he could really tear things apart. I wanted to wait until we stopped for the night before doing anything. 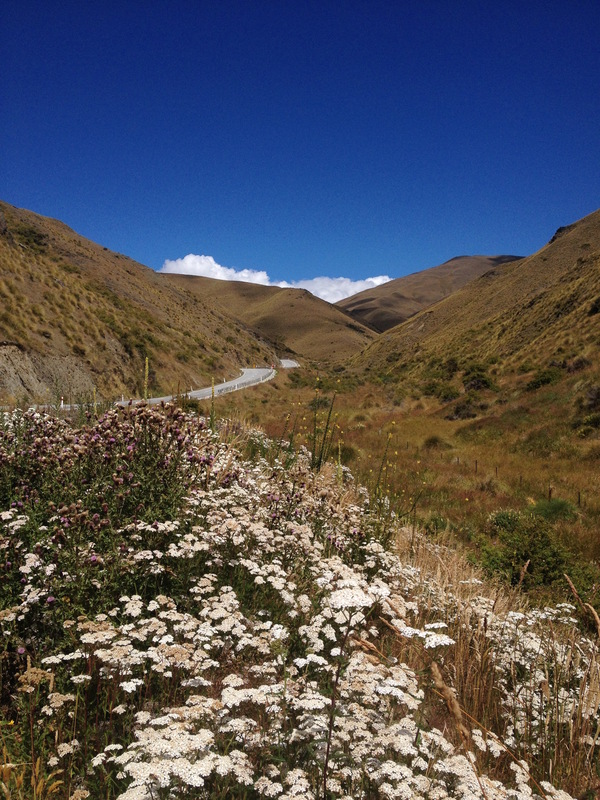 We were finally onto a different route when we pulled out of Queenstown. We climbed the Crown Range along a series of tight hair pin bends that swept back and forth across a cliff face. The view from the top looking out across the Lake Counties was sensational. The road kept climbing, we stopped several times to take in the new view. Rolling folds of rock and earth spread out before us. The road through the Kawarau Gorge that had lead us in days ago was a thin, meandering line along the base of the mountains. Upon reach the summit we turn into a valley, our new road joins a creek and we cross it ten, tweleve times as we descend. The creek becomes a glistening river crisp and inviting in the afternoon sun. It would have been all too easy to sit under a tree, pull out a pip and wait for Gandalf. We drove through Wanaka, bounded along the shores of Lake Hawea lined with mountains that curved up like the shattered bones of the world. We stopped for a paddle. The water barely reached our knees, it was pleasantly warm. The pebbles underfoot were paper thin, you could snap them between your fingers like biscuits. They were perfect for skimming. An activity that is apparently not on the list of things to do before your 11 and 3/4s according to Mum. I don’t know how long it had been since I last skimmed stones but I was getting seven or eight bounces of every stone. 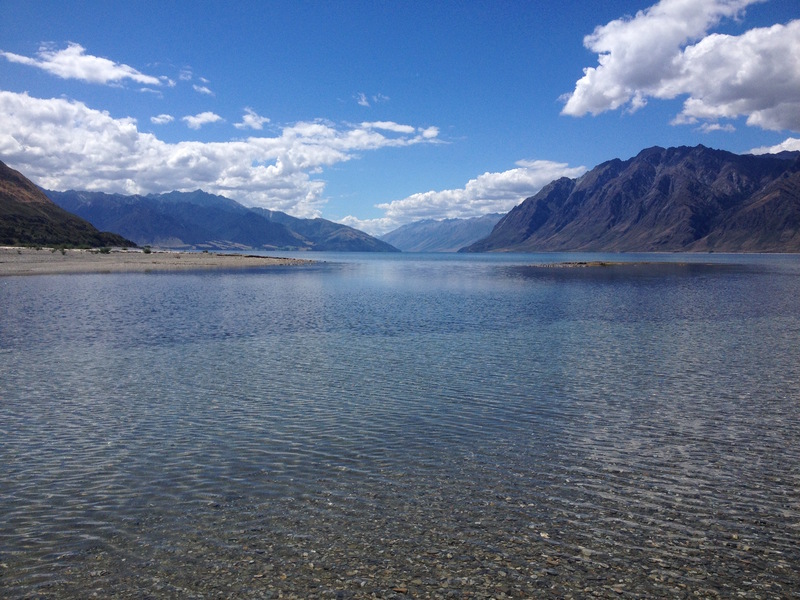 We drove on a little further, crossed the the hills that seperated Lake Hawea fron Lake Wanaka and stopped again. 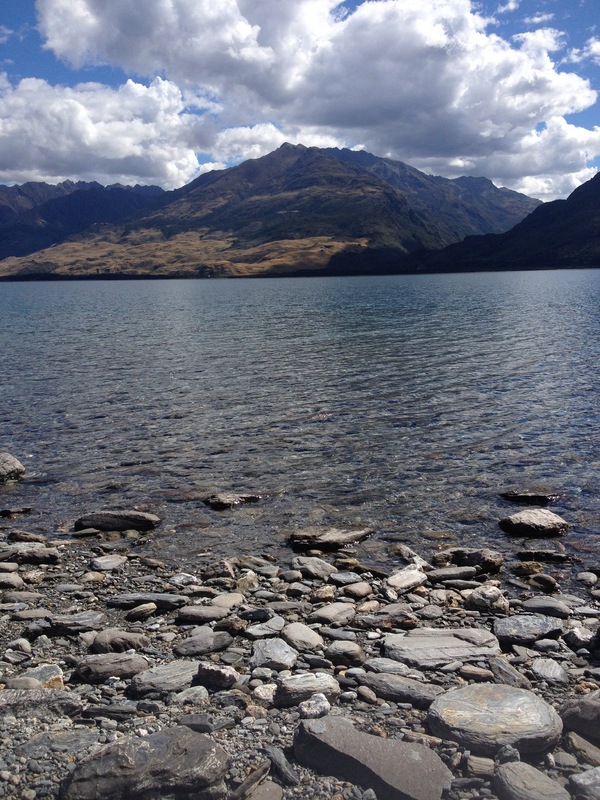 The water in Lake Wanaka was icy cold, the stones were like layers of paper, glued together and set to bake hard in the sun. 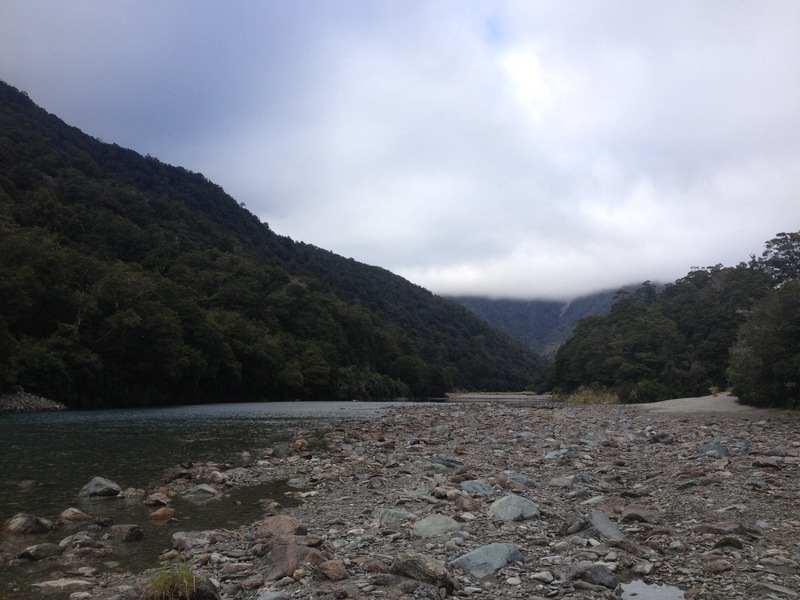 We pushed on along the Haast Pass into the Mount Aspiring National Park. We were in the foot hills of the Souther Alps once again. We stopped to check out the blue pools. 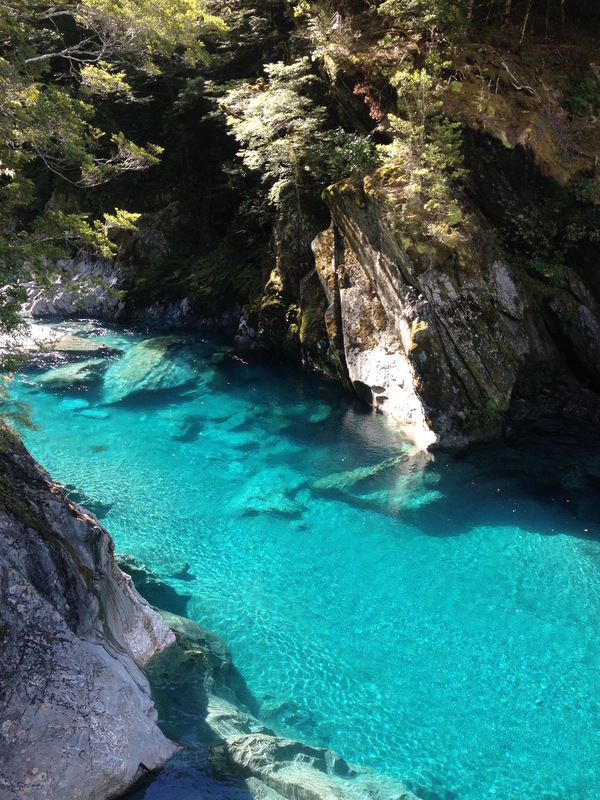 I don’t know how more many times you are going to hear about unbelievably clear, glacial blue water. It looks like it should be on the front of a brochure for the Bahamas. Nothing can actually be that blue, can it? Here it was again. 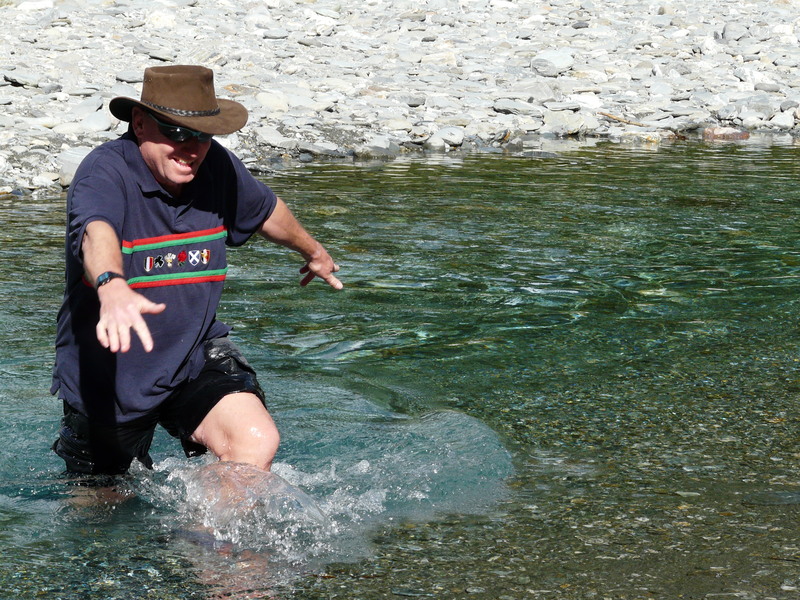 Winding through the trees, slowing down to form deep pools as a stream joined the Makarora river. We paddled again. The frosty temperature of the water might have been a wonderful relief in the heat of the day but with evening approaching I wasn’t keen on a swim. Crossing to a stony beach was significantly easier for some than others. Dad found out the hard way that the clear waters can be deceptively deep. As we climbed higher in to the mountains, we drove past an unusual sign. Runaway vehicle ramp 1km ahead. A rather terrifying portent of the road to come. We twist and turn down the valley. The longest kilometre in the world passes and there it is. An almost vertical strip of tarmac that rises into the hills. Not a place I’d be keen on losing control of my vehicle. We pull into Pleasant Flats. Dad cracks out the screwdrivers and takes a decorative cushion of the back of the seat. More postcards tumble out. The journal is less forthcoming. It slowly budged towards us. Closer and closer it came until it eventually toppled over the back of the screw. It was saved! It turned out not to be the only personal possession that had been lost down there. We also pulled out a child’s Argentina football shirt with Messi printed on the back. I suspect that there’s a young boy out there who will now never forgive his parents for not making the effort to retrieve his shirt! Uhhh can I just tell you… Your pictures are absolutely breathtaking! Loved this and look forward to reading more. And I now know what pogs are! Thanks a lot! Plenty more to come!